Tag Archives for " Easter "
Don’t judge a book by it’s cover : A Crucifixion in San Fernando. Hey, we at Roads-2-Roam ain’t taking the hit for this one.. It wasn’t us. The Philippines are an ultra-Catholic country. So it goes then that Easter is one of the THE most popular holiday of the year. So much so, that some of the pious volunteer to be crucified. Yes, you understood correctly : they put themselves forward to be fully nailed up on a cross and not the Crucifixion-lite namby pamby roped up version. Ferdinand Caylao, executive committee chair for Maleldo (Kapampangan for Holy Week), said Telesite company installed CCTV cameras in San Pedro Cutud that would be operational from Holy Thursday until Good Friday. Crucifixion rites annually take place in Barangays San Pedro Cutud, Sta. Lucia and San Juan, but most tourists flock to San Pedro Cutud where “Kristo” Ruben Enaje would be nailed to the cross for the 30th year. The purpose of the CCTV in such a place of holy reverence is to capture people at ease with their religion catch pickpockets. I see something wrong amiss there. Not only that but there will be medical crew there. “The city’s health and disaster management officers would also deploy medical teams in the crucifixion sites.” said the Philippines Star. Nails. Crucifixion. Health and Safety. I seem to recall hearing about those together before. Now where was that? Oh yes, back in 2008 where Health officials in the Philippines issued a warning to people taking part in Easter crucifixion rituals. They urged those about to be Flagellated or Crucified to get tetanus vaccination before hand and if being nailed to a cross, to practice good hygiene. Seriously? Now to come back to Mr Enaje. He’s a bit of a folk hero where wheresidewalksend has some more details on him. 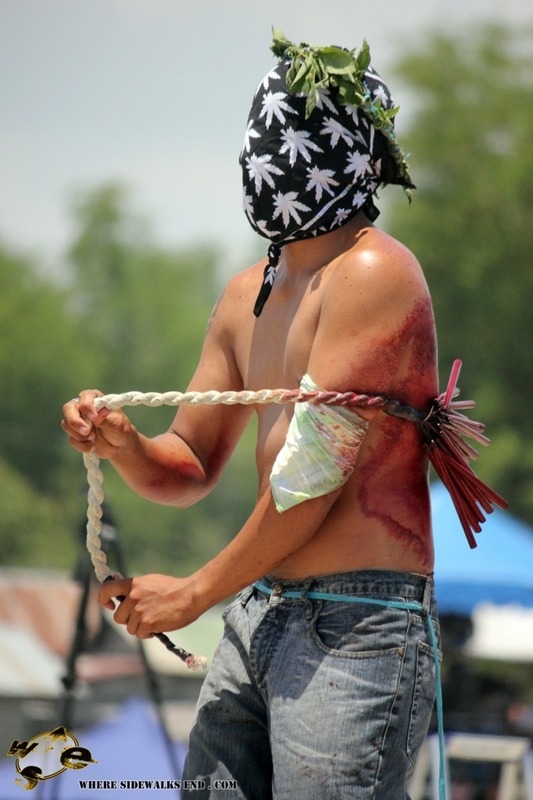 From that page, I just love the picture of the guy self flagellating himself but look at his face mask. Surely it should be Mary Magdalene not Mary Jayne.